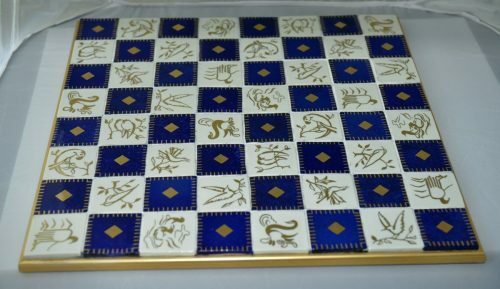 These spectacular porcelain Sevres Abstract Chessmen are European, custom made to order, reproduction of these famous ceramic abstract chessmen originally attributed in 1923 to Suzanne Lalique-Haviland. The Art Deco chess pieces are blue, green and white with gold embellishments. The chess set includes a matching Blue and White Art Deco Ceramic Chessboard with gold trim measuring 18” square. This is set #1 of only two reproductions made. The chessboard is the only one in existence. The King stands 4-3/4” tall.